Consider Becoming a JBBF Volunteer? Read, Sign Up, Help Out! We Need YOU! VOLUNTEERS MAKE THE DIFFERENCE. JOIN THE TEAM! I’ve described Jenny Brook in the past as a puzzle. It’s made up of tons of different pieces and when one is out of place, the puzzle doesn’t look all that great. Without volunteers helping in many different ways, the puzzle can’t be put together. Numerous hours are put in before the week of Jenny Brook. Starting on Monday, June 18th we’ll start needing your help to pull off one of the best festivals in the northeast. Thank you in advance for filling out and submitting the application. We’d like to be able to give everyone a chance to be part of the Jenny Brook Team but there are only so many slots. Placement will be given to the person we feel is most qualified for the job. Definition for volunteer: a person who does work without getting paid to do it. Volunteering at Jenny Brook is a huge commitment. Volunteers are required to work a minimum of three to four-hour shifts each day depending on which area you’ll be volunteering. In exchange, you will receive your full festival ticket. Some positions don’t require as much time and they will only be eligible for a reduced rate on your festival pass. This will be discussed with the Volunteer Coordinator. Applications must be received by April 8, 2019. You will be notified if you have been chosen to join our team. Please don’t fill out this form if you are not able to commit. Anyone who has never volunteered at Jenny Brook, or has failed to report to a scheduled volunteer position in previous years without notifying Jenny Brook, must mail a personal check for $45 made out to Jenny Brook. This check will be held until the final day of scheduled shifts. 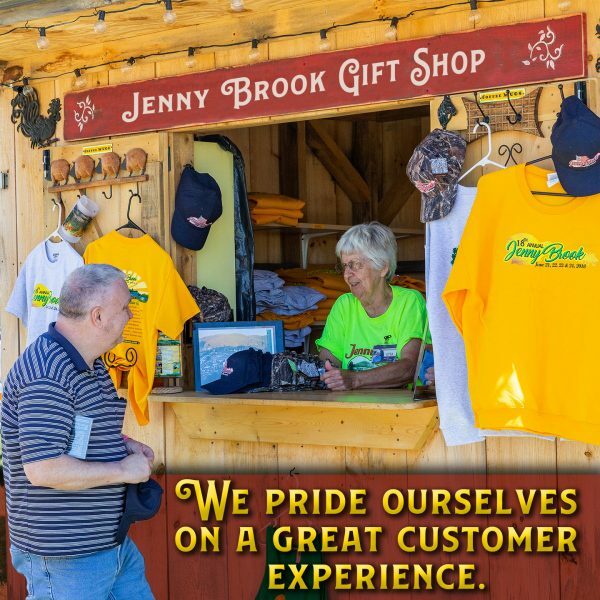 The deposit check may be picked up at the Jenny Brook Store after the successful completion of all scheduled shifts. Checks not picked up will be shredded. Only personal checks will be accepted. DO NOT MAIL THIS until you hear from the volunteer coordinator saying you have been chosen as a volunteer. CANCELLATION POLICY FOR ALL VOLUNTEERS Notification of cancellation for Jenny Brook must be received by 5 pm EST June 1st. This includes any individual shift cancellations. New volunteers who cancel after that date or fail to successfully complete any volunteer shift, will have their deposit check cashed by Jenny Brook. Neither new volunteers nor veterans who cancel after June 1st will be considered for volunteer positions the following year. BLUEGRASS GREEN MOUNTAIN STYLE! 66 Days 13 Hours 18 Minutes 46 Seconds till the GATES OPEN!